If you thought Marty McFly was a fashionable young man, or enjoy adding technology to almost anything – you too can make your own sneakers with power lacing. 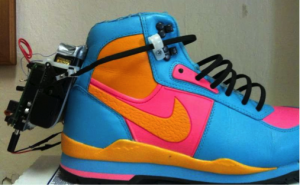 Instructables user “blakebevin” has created a sneaker with a replica of the power laces seen in Marty’s Nikes in “Back to the Future II”. And doing it yourself isn’t that difficult at all. Attached to the back of the shoe is an Arduino board which controls two servos via an Arduino motor driver shield. There is also a force sensor inside the shoe which can detect the presence of your foot – and once detected the Arduino will activate the two servos which each control one lace. The amount of pull each servo can manage will depend on the external smoothness of the laces and the holes in the shoe. To release the laces, a small button has been fitted which tells the Arduino to reverse the servos for a moment, which loosen the laces. Also, a small LED has been fitted into one of the top lace holes to show the status of the laces. Finally the power supply is a battery fitted with the Arduino.